Mixing and Matching is one of the most fun, and most important, elements of picking out an outfit. This includes deciding which jewelry will complement your wardrobe choices. But sometimes picking just the right necklace or bracelet can begin to feel like a frustrating and time-consuming task. The announcement of a new piece of jewelry that can change colors to match—or compliment—your outfit, means a lot less worrying about whether or not those gemstones are the right shade of blue for that blouse. From Jewelectic Ltd., the Algara is the first ever Smart Jewel System that vies users the ability to manage the shade of gemstones according to what he or she is wearing. 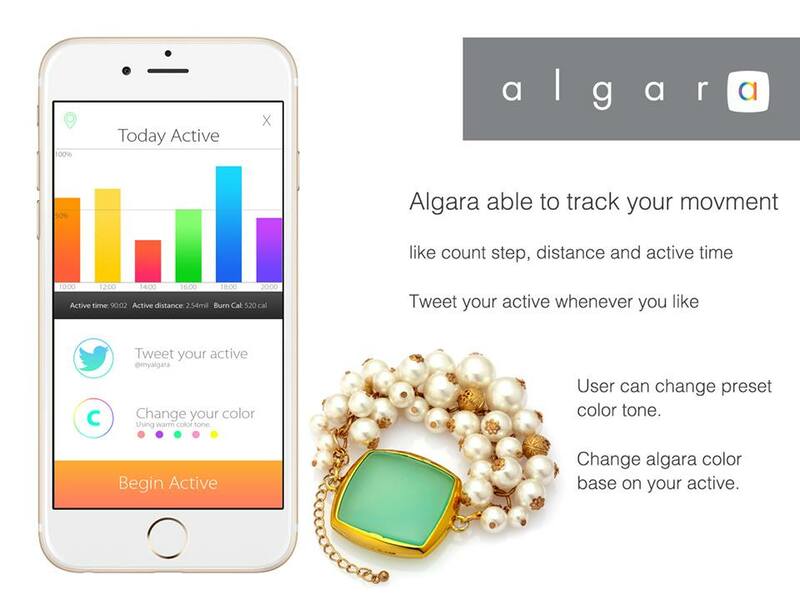 Being called the first “Smart Necklace,” Algara works via a mobile app installed to the user’s smartphone or tablet. Users snap a selfie of their outfit and uploads, and the app then makes recommendations for what color the gemstones should be based on the current color scheme. The user is then at complete liberty to modify the color of the gem based on this information, or to simply ignore the recommendation, and go wild with whimsy. The interchangeable, white jade gemstone is laid into an 18K gold-plated, O-mount surrounding casing that can become more than just a necklace: It can also clip to bracelets and rings. Open source capabilities will also allow programmers to expand upon the gemstone’s 16.5M RGB color options, alter Bluetooth functionality to control multiple Algara gems simultaneously, and much more. What’s more, Algara will have a 12-hour battery life, and can be wirelessly charged via an inductive charging pad. It will also feature connectivity with the Apple Watch—allowing owners of the new timepiece to interact more quickly with Algara. Upon launch, Algara will only function for iOS, but will be promptly followed by an Android version. Tim Gunn, renowned American fashion consultant, has a famous tagline he uses on nearly every episode of Project Runway: “Make it Work.” With the ability to change color to suit your wardrobe selections, Algara “makes it work” for you.